The Grand Canyon is the result of millions of years of corrosion by the Colorado River, which resulted in endless kilometers of mind blowing beauty. Come check out this beautiful natural attraction! With this route you will be able to find out what to expect from the Mather Observation Point at the Grand Canyon South Rim. When you arrive at the South Rim's parking lot you'll find a guest information point as well as a souvenir store. 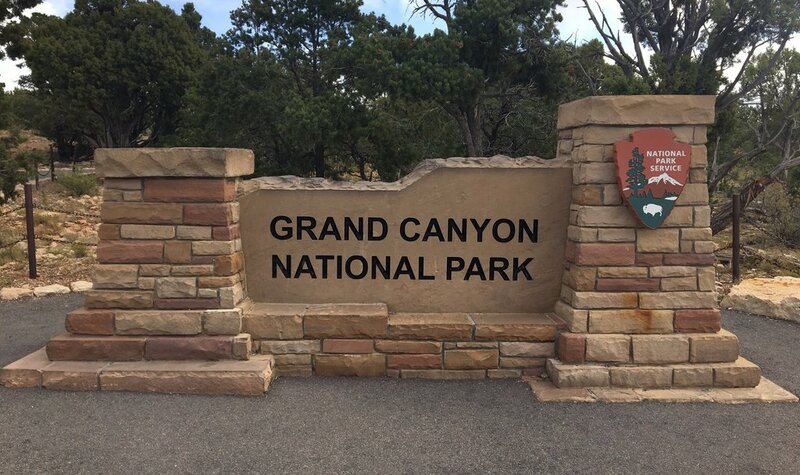 You'll also be able to take a picture with this cool Grand Canyon National Park sign and make all your Instagram followers jealous. If you keep to the right (and always follow the path to the right) it won't take you long before you discover the incredible view. However, during this walk you will also be able to find picnic tables and rest areas where you can rest your legs a little and have a bite to eat. The Colorado River, which has ran through the Grand Canyon for longer than anyone can pinpoint, has been eating at these rocks for millions of years. Up until recently it was believed that the carving started 6 million years ago, however in a recent (2012) study professionals found that this carving may have actually started around 70 million years ago! The Grand Canyon is absolutely enormous, stretching over 446 kilometres in length This (roughly 277 miles). It is absolutely impossible to visit all the view points in one day, as the South and North Rim stand at about a 5 hour drive from each other (6-7 hours by bus). The Grand Canyon reaches a width of 29 kilometres across (18 miles) at one point, and is about 1800 meters (or 6000 feet) deep. The Grand Canyon is not the deepest, longest, or even widest of its kind in the world. The Grand Canyon is the home to rocks that date back to 2 billion years ago! At the very bottom of the Canyon Schist can be found, and this is about 2 billion years old. Near the upper rim limestone which dates back to 230 million years ago can also be found. Due to the diverse amount of different rocks that can be found here, it is a very important location for geologists to do research and is therefore preserved very carefully. Officially, the Canyon only became a national park in 1919. It was actually the 17th United States’ national park to be established. The first expedition down the Grand Canyon was led by John Wesley Powell in 1869. This expedition gave it the name Grand Canyon. Before this expedition, people referred to it as the Great Canyon or even the Big Canyon. The park receives over 5.9 million visitors a year! Besides sightseeing many of these tourists come to the canyon for hiking or rafting, which are also very popular here. Camping in the Canyon overnight, however, requires a special permit from the Backcountry Office seeing as doing so can prove to be very dangerous if not done correctly. For example, the Bright Angel Ranger Station located on the North Rim is one of the coldest and wettest locations. However, just 15 kilometres (8 miles) away, the Phantom Ranch tends to be the Canyon’s driest and hottest locations. As you can see, the views from the Mather Point are absolutely breathtaking, and it is well worth it to just sit down and take it all in, after you are done filming and taking all your pictures. Along your walk you'll be able to find a lot placks like this one above that will give you a lot of information and fun facts about the area you are in/looking at. You'll find a lot of wildlife along your walks such as deer. They roam around and generally keep away from people. People actually live in the Grand Canyon, in a small village called Supai Village. The Super Village can be found within the Havasupai Indian Reservation and is the home to the only human population in the area (excluding tourists). The small village is the home to just 208 people, and is not accessible by road. It is possible to get a view of the park from above without actually taking flight! On the West Rim of the Grand Canyon you’ll be able to find the famous Skywalk, a horseshoe shaped steel and glass bridge that hands off about 70 feet from the rim. However, it is also a possibility to do helicopter tours of the national park. If you have a smaller budget or are too afraid to fly, the Skywalk is your best option! Watch out for the squirrels, as they were considered the most dangerous animal in the park! It is commonly known the the Grand Canyon is the home to a wide array of wildlife. Here you can find animals like the California Condors and Bighorn Sheep. However, it is the Rock Squirrels that cause the most commotion year long. This is because of their cute appearance, and therefore tourists tend to try to feed these animals which get very close to humans. However when close enough these animals will attack if they feel threatened, their bites hurt, and they can carry diseases. Thus, it is best to stay away from any animals you encounter whilst at the park, and it is best not to feed them.